A photo taken for the forth birthday of Hair. 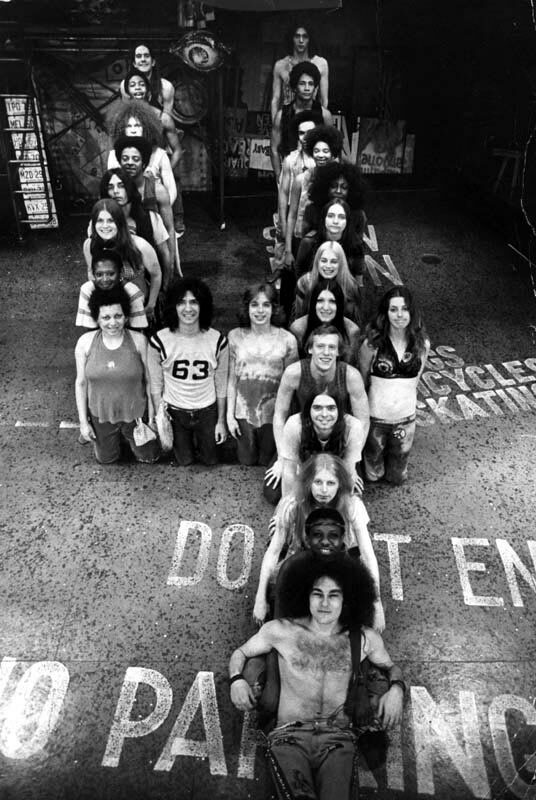 About 75% of the then current cast posed on the stage. Left vertical, top to bottom: Willie Windsor (Claude), Michael Rhone (Hud), Peppy Castro (Woof), Bobbie C. Ferguson, One of the Alessi twins - either Billy or Bobby, Candice Earley (Sheila understudy), Stephanie Parker, Zenobia Conkerite (Dionne). Right vertical, top to bottom: ?, George Turner, Carl Scott (Aquarius), Marjorie Barnes, Mary Seymour (Dionne), Dale Soules (Jeanie), Beverly Bremers (Sheila), Ula Hedwig, Bryan Spencer (Tourist Lady), Jonathan Johnson (Claude and Woof), Kathrynann Wright, Valerie Williams (Abe Lincoln), and Gregory V. Karliss (Berger). Middle horizontal row, left to right: Zenobia Conkerite, Jose Fernandez, Stephen Fenning, Ula Hedwig, Debi Dye (Crissy understudy).